Voting Early is Not a Sign of Electoral Health | Jenkins Research Inc.
During the last Canadian federal election campaign, there was considerable speculation about the large increase in turnout at the advance polls. At the time I speculated that the media and other commentators were wrong in suggesting the increase was a product of the campaign (e.g. greater interest). I thought I would revise the issue and see if we could better understand the dynamics of voting early. First, now that the official numbers are out we can actually get a better sense of voting in the 2011 federal election. Turnout (votes cast divided by registered voters (not actual eligible voters) was officially 61.1% in Canada. This represents a modest rise from 58.8 and does not match the 64.7 in 2006. In 1997 only 5.4% of all votes cast were at the advance poll (which are held on the 10th, 9th and 7th day before Election Day) compared to 14.3 per cent in the last election. 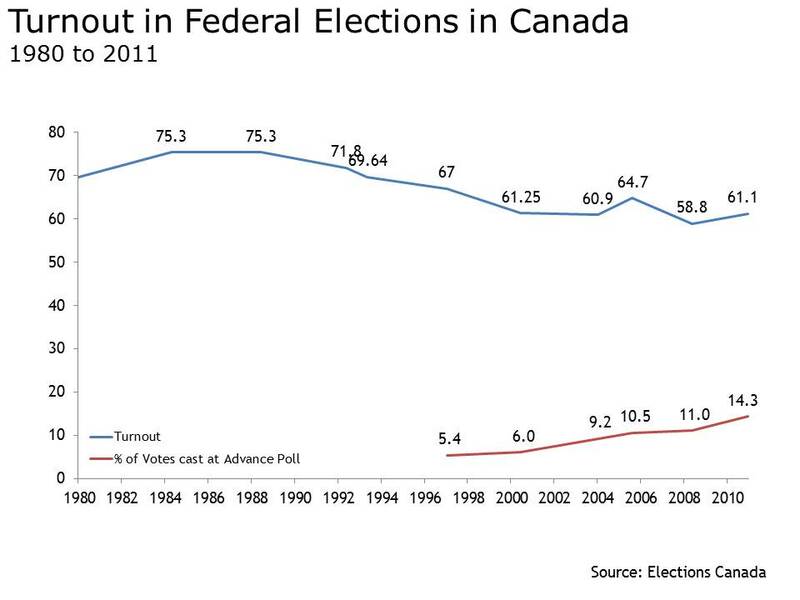 The trends of turnout and voting in advance polls are not following the same path. Given this, it is hard to see that the surge in advance poll voting represented rising public interest. With each election campaign, more and more voters decide to cast their votes at an advance poll and Elections Canada is making it easier by expanding the number of these polling stations. Older Canadians are the most likely to vote and to take advantage of the advance poll when they do so. It is not reaching people who otherwise would not have voted. Voting early is associated with having made up one mind before the campaign started, with higher interest, and with feeling an obligation to vote. So, clearly the combined evidence suggests that voting early is just a new phenomena in Canadian elections. The trend toward early voting is likely to further reduce the impact of the campaign on the outcome and therefore lead to greater importance for the non-election period — when, ironically, fewer people are paying attention to politics. While giving people more opportunities to vote is a plus, we should not take evidence of voting in this way as a sign of electoral health. In fact, it may be a sign of quite the opposite.